Margosa or Neem oil is a yellow oil with a disagreeable smell and bitter taste that has been used as a medical remedy in India and Southeast Asia for several centuries. In recent years, there have been rare reports of acute onset of severe metabolic acidosis, hepatic and multiorgan failure and death following ingestion of margosa oil. Sri Lanka. In low doses, margosa oil has been a traditional remedy for centuries in India and Southeast Asia used in treating asthma, intestinal parasites, arthritis and leprosy. It is also an insecticide. The oil has a disagreeable smell and bitter taste attributable to volatile sulphur compounds and fatty acids. The bitters are secondary products formed during storage of the oil or the seeds and concentrations can vary in different commercial samples. Margosa oil can cause severe metabolic acidosis and death, particularly in young children. Symptoms of nausea, vomiting and progressive stupor develop within hours of consumption, followed by severe metabolic acidosis, coma, and progressive hepatic dysfunction, similar to Reye Syndrome. Serum aminotransferase levels are generally normal or minimally elevated initially, but then rise to high levels accompanied by increases in LDH and CPK levels. Progressive hepatic encephalopathy and cerebral edema develop within days. This product contains high levels of salicylates – the same as aspirin. Therefore, this product could trigger Reye’s Syndrome and should not be given or used by children under the age of 19. 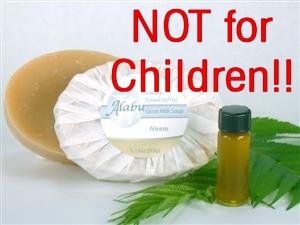 Again, we urge extreme caution in using herbal remedies, and always check for salicylates in any product given to children under the age of 19. The mechanism of hepatotoxicity of margosa oil appears to be related to mitochondrial dysfunction and poisoning of the electron transport pathway by a component of margosa oil or a contaminant. A similar syndrome has been induced in laboratory animals with samples of the implicated oil.